Padded laptop compartment walls provide extra protection. Fits Macbook Air, Pro 13.3" and all ultrabooks. External pocket for device or Tablet PC. 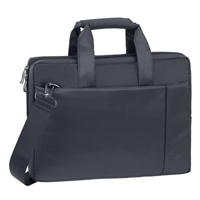 Front pocket panel provides basic organization for mobile phone, documents, accessories. Dual zipper pulls for easy, quick access. Comfortable padded handles and a removable, adjustable strap with anti-slip shoulder pad. 12.99" x 9.45" x 1.57"
13.78" x 10.43" x 2.56"